Admission is $7.50 and includes a glass of wine. Silver Coast Winery is located at 6680 Barbeque Rd NW, Ocean Isle Beach, NC 28469. We are so sorry to announce that the Ann B. Ross Book signing scheduled for April 8th from 4pm-6pm has been canceled. Ann will be unable to attend due to an illness. We apologize for any inconvenience this may cause, we hope to see you at the next event! New Nicholas Sparks Book Set in Sunset Beach NC! Nicholas Sparks’ New Book will be set in Sunset Beach, NC! That’s right the one and only Nicholas Sparks has announced that his newest book Every Breath will be set in our very own Sunset Beach, North Carolina. We’re so excited he’s picked Sunset Beach and we can’t wait to read the story! Maybe Pelican Bookstore is in it? Who knows!?! His book will be in stores on October 16th! 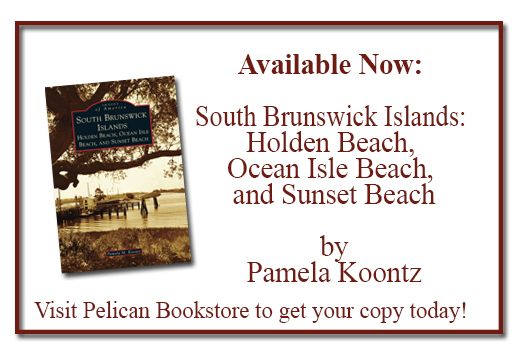 Comments Off on New Nicholas Sparks Book Set in Sunset Beach NC! Sometimes I discover a new book that leaves an imprint on my heart. I never would have thought that a story about a mama cow (Mama Red) and her calf (Lucky) would touch me so deeply. Mama Red and Lucky teach a human mother unconditional love, perseverance, bravery and bittersweet sacrifice for those we love. It’s about never giving up. The author writes with a poetic hand causing you to pause and savor her descriptive prose. The setting is rural countryside where nothing fancy exists but it is the simplicity that speaks volumes in this tale. I took my time reading this one like you do when you savor your favorite dessert, not wanting to finish it, letting the words settle in my mind. I won’t soon forget the sweetness of this story. Bren McClain has written a jewel of a debut. Southern fiction at its finest.